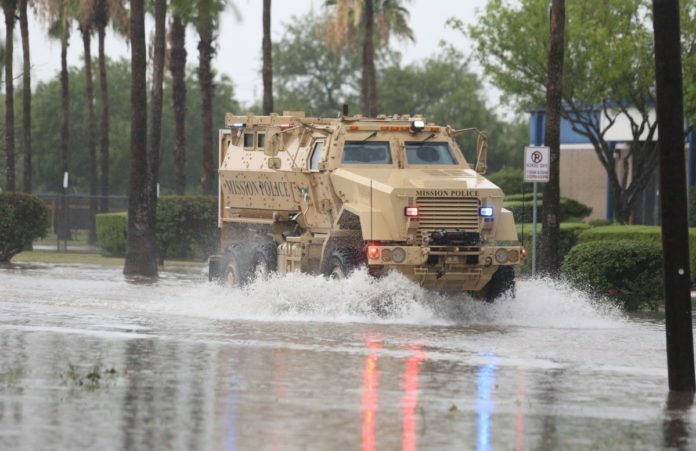 A Mission Police emergency vehicle wades through water after heavy rains caused water to rise and flood whole neighborhoods on Thursday, June 21, 2018, in Mission. The hope is to receive assistance from the Federal Emergency Management Agency, or FEMA. In order to do that, however, Hidalgo County, along with five other counties that experienced extensive damage from the storms, must reach a combined $38 million threshold of estimated damage, Mission City Manager Martin Garza said at a news conference Monday. The two-day heavy rainfall last week hit the city particularly hard on Thursday, flooding many streets especially along FM 495 where a nearby drainage canal overflowed. The city reported seven inches of rain over four hours. Last week, County Judge Ramon Garcia signed a disaster declaration followed by a declaration from Gov. Greg Abbott for Hidalgo, Cameron, Aransas, Nueces, San Patricio and Willacy counties. It is up to Abbott to request FEMA assistance if “the situation is beyond the capability of the State and affected local governments,” according to a FEMA fact sheet. However, it is ultimately up to President Donald Trump to declare Texas a federal disaster state as a result of the storms. Mayor Armando O’Caña said gathering that information would still be useful for planning purposes. The city council unanimously voted to request proposals and statement of qualifications for engineering services for a drainage assessment. The form, available in English and Spanish, requests information such as the water level in a structure, percentage of the damage, the building type, whether it is rented or owned, whether a person has home owner’s insurance, property value, estimated income and estimated loss. It is for Mission residents only and is not an official FEMA reporting document.